Basic soccer rules for kids and adults. Soccer is a complex sport but the rules are simple. The objective is to get the ball in the opposing teams goal. You probably new that right? Well..there are a few more rules you might want to know. The rules become more complicated and technical with the level of play. But even at the professional level they are quite simple. FIFA, International Federation of Football, holds the official rules to the game. According to them, the official rules may be modified in their application for players of under 16 years of age, female soccer players, veteran players (over 35 years of age), and for players with disabilities. For a 5v5 soccer experience we recommend a futsal regulation size dimensions. This creates an amazing experience pushing technical versus kick and chase ball. Visit our Soccer field layout page for dimensions specific to age and group size. 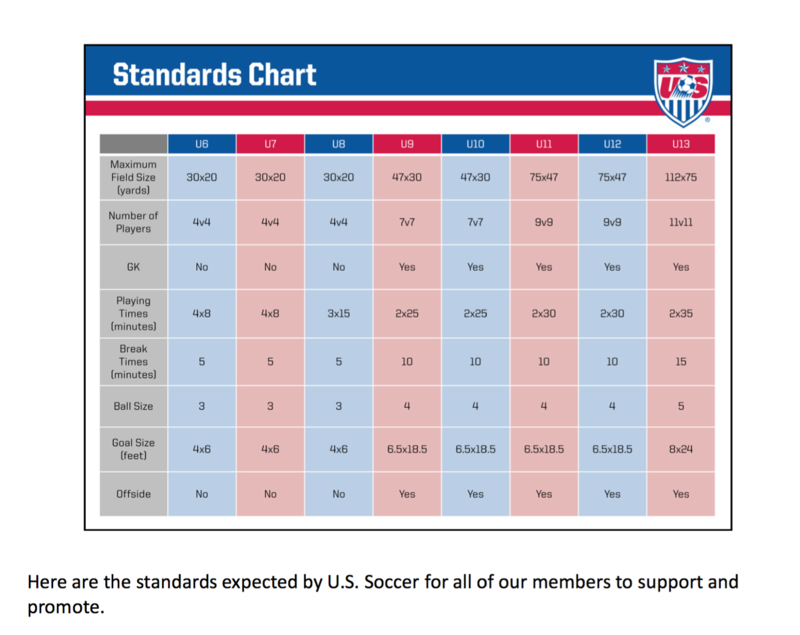 The U.S. Soccer federation also has a chart with their promoted field sizes. Ball Size: The ball size depends on age. Below is basic soccer rules sizes. We suggest the following sizes for all development programs. 3-5 y/o - size 4 - Size 3 is a good size to kick inside the house or back yard play. However, they will outgrow size 3 fast and because of limited size the tow kick becomes a problem. In some countries they actually use a flat size five so the child gets more touch on the ball. The more surface to touch the better the development. 6-12 y/o - size 4- Size 4 will be used until about 11-12. It is a great size for development and a futsal ball is size 4 as well. We prefer to develop players under 12 with 4's and 5's. 12 y/o -adult - size 5. This is the standard size for professional and adult soccer. Some countries introduce size 5 to kids as young as 4. The ideas is more surface of ball = more surface of boot. Players: soccer is played by two teams preferably equal number. Max players per team is 11 (Goalie + 10 field players). Team size is reduced by age. Some leagues play with 8 players for youth aged ten and under. And down to 6 per side for the under 5's. For optimum development we suggest futsal rules 5v5. Substitutions: Officially, you are only allowed 3 subs per game, however, depending on modified rules this may be different. For youth leagues usually there is no cap on subs. A substitution can only be performed when the ball is not in play and your team has possession. (Ex) it's a throw in for your team, or goal kick for your team. Substitutions cannot be made when the ball is in play (even if your goalie has the ball in his/her hands.. this is still in play) This is different if your playing futsal rules. Starting the Game: The game begins at the center of the field. The team who kicks off passes the ball to a teammate at the referees signal. Previous to 2016 the ball had to move forward at kick off. This has been changed by the IFAB (The International Football Association Board). Now the ball can be passed back at kick off. 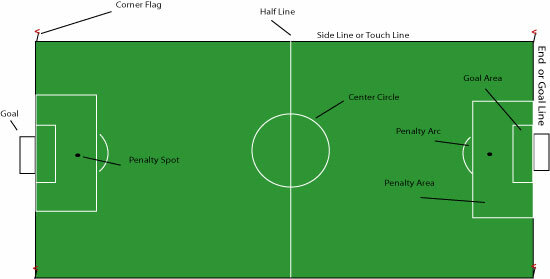 The opposing team is not allowed to enter the center circle until the team kicks off (some get confused with the refs whistle as the signal to play but it really begins with the team kicking off). Game in play: As long the ball stays in the field the game is in play. The only exceptions is when the referee blows his whistle for an infraction or offside. The ball is considered in play as long as it is in side the end lines and side lines. Furthermore, it's still in play as long as it has contact with the line. Therefore, the ball may be touching the outer part of the end line or side line and still be considered in play (This applies if the ball is in the air as well). contact with the goal post, corner flag, and referee back in the field is still considered in play. The referee is considered a fixture of the field. GOAL: In the basic soccer rules the point of the game is to get the ball in the opposing teams goal and the team with the most goals after the specified time is the winner. The ball must cross the goal line to be a goal. Therefore, if the ball is still in contact with the end line in the inner part of the goal it is not a goal! I have seen pro's sweep through the end line to save their team from a goal. Everybody swears that it was already in but the cameras show the ball was still in contact with the line (This applies if the ball is in the air as well). This has happened in the world cup and causes some controversy and drama as the human eye decides if it was a goal or not. Goal line technology is now being implemented at the professional level to assure the right call. Youth games range from 15-30 min halves with a 7-10 min half time. NO HANDS! Alright, I know you probably knew this but here it is anyway. Only the goalie can use their hands. the definition for hand ball is any part of between your fingers (including nails) to your upper arm. Your shoulder is actually legal to use! One side note about goalies. the goalie is not allowed to use their hands if the ball was kicked back to them intentionally by any of his/her team mates. This rule is about 25 years old. in the old days defenders, when under pressure, would pass the ball back to their goalie to secure in their hands (this was a good rule change for spectators). Youth leagues under 10's don't really enforce this rule as most of the time it isn't an intentional pass back. Soccer is very simple and very enjoyable. Don't complicate the basic soccer rules too much with technical rules that only apply when playing competitively. Soccer for kids age 3-10 should exploratory. This means the games need fluidity and need to be fun. The rules will apply at some point but be cautious and selective as to when to enforce them. Now that you know the basic soccer rules how about basic soccer skills? visit our How to play soccer page to know certain soccer milestones for your age group. This will give you a good road map for the season. Soccer is unique in that the players create the show. The coach should have little impact during games allowing players to enjoy and perform their best! a 4-5 y/o child new to soccer should focus 80% on body control. 5-6 y/o children should be able to turn ball with body and have adequate exposure to real soccer. A 7-8 y/o should be able to execute three turns and control and pass ball efficiently. A 9-12 y/o player needs adequate exposure to real soccer and should be comfortable in turning ball, passing, and shooting with laces.